Our neighbor came to the door this afternoon asking if the reds could help her with a project for school. They happily agreed to help her. Once I found out she needed some photos taken I asked if she wanted me to help as well. She said yes. We armed ourselves with cameras and followed her to her house. B needed some pictures of herself doing things she likes to do, i.e. softball and volleyball. She is supposed to write poems about the pictures. We went to the backyard for the photo shoot. 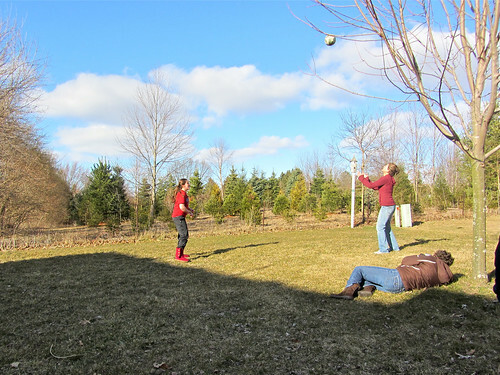 Her mom was also there taking pictures, when she wasn't passing a ball to B. Mat had a camera and took this great shot of how things looked during the shoot.